Tracking Beaufort Sea polar bears over the summer — what can it tell us about how important the position of summer sea ice relative to the shoreline in this region is to these bears? Do Beaufort Sea bears get stranded on shore like the polar bears in Davis Strait and Hudson Bay? Polar bear biologist Eric Regehr (with the US Fish & Wildlife Service, or FWS) has a team working with US Geological Survey researchers (USGS) in the southern Beaufort tracking where adult female polar bears go throughout the year. This is part of on-going research in the Beaufort and Chukchi Sea (see previous post here; see also Fish & Wildlife 2009; Polar Bear News 2010 and 2013; Rode and Regehr 2010, pdfs below; and just out, the “accepted” version of the Rode et al. paper discussed here, and announced in my last post here). The researchers have been posting a summary map at the end of each month on the USGS website showing the tracks of the females they fitted with radio collars the previous spring — for 2013, and back to 2010. They can’t put collars on male bears because their necks are larger around than their heads, so a collar would just slip off. 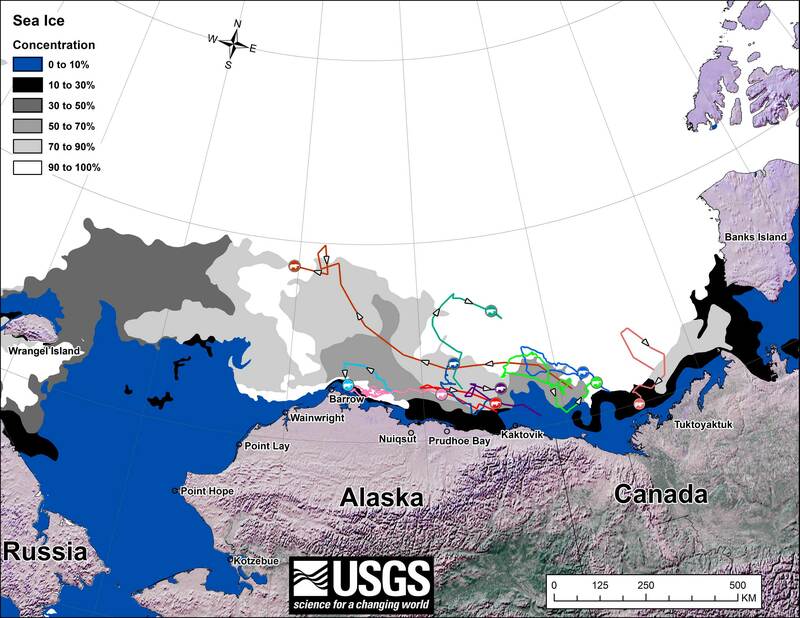 I’ve posted the July 2013 track map below, which shows all ten bears out on the ice, and the previous month (June 2013) to compare it to (the August map should be out shortly). I’ve included a few maps from 2012 to allow you to compare this year’s results to the situation last summer. Figure 1. 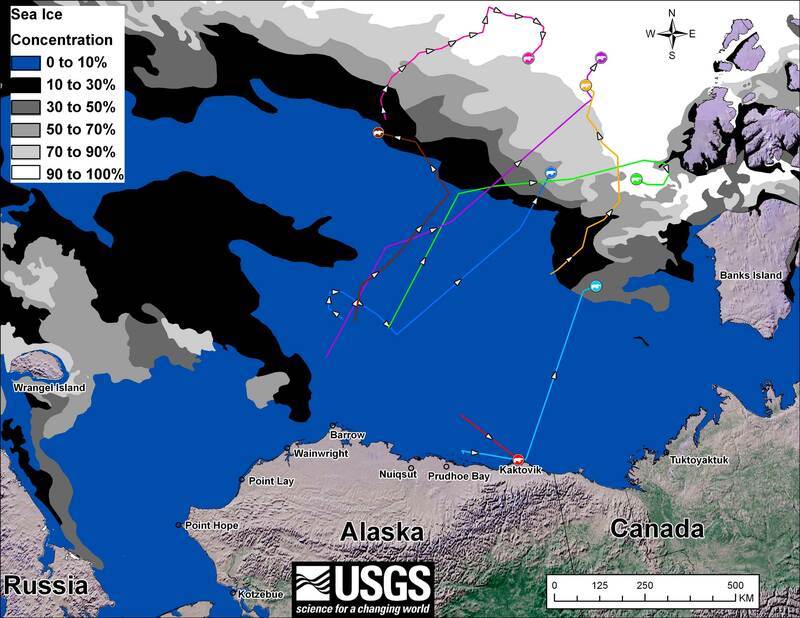 Movements of 10 satellite-tagged polar bears for the month of July, 2013. Polar bears were tagged in 2013 on the spring-time sea ice of the southern Beaufort Sea. All 10 of these bears have satellite collar transmitters. 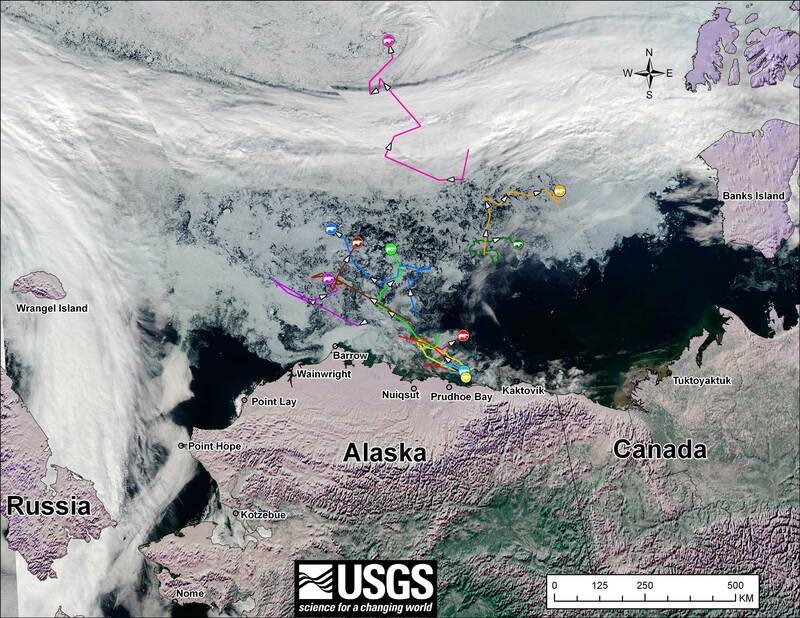 Polar bear satellite telemetry data are shown with Ice Analysis charts from 29 July, 2013. Ice Analysis charts are made available by the National Ice Center. The land cover is made available by Natural Earth [this is the original caption]. Click to enlarge. Figure 2. 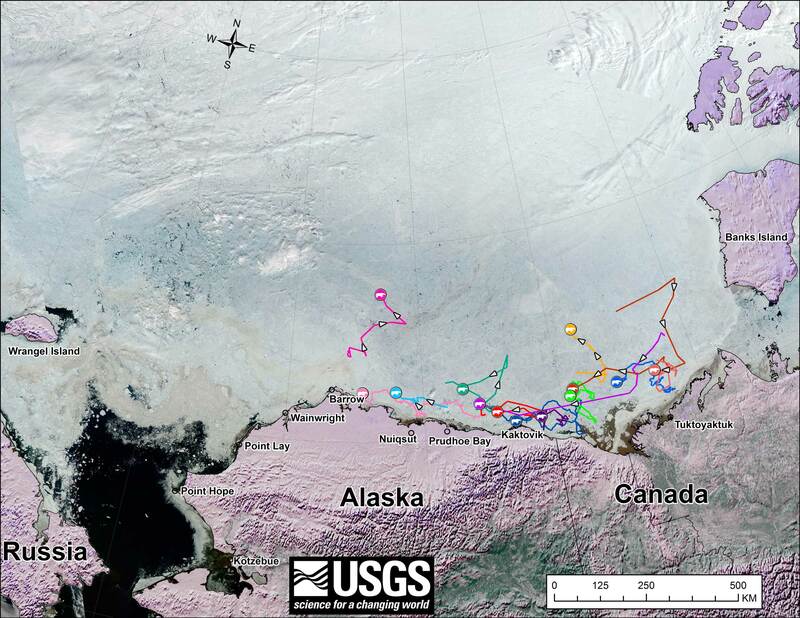 Movements of 13 satellite-tagged polar bears for the month of June, 2013. 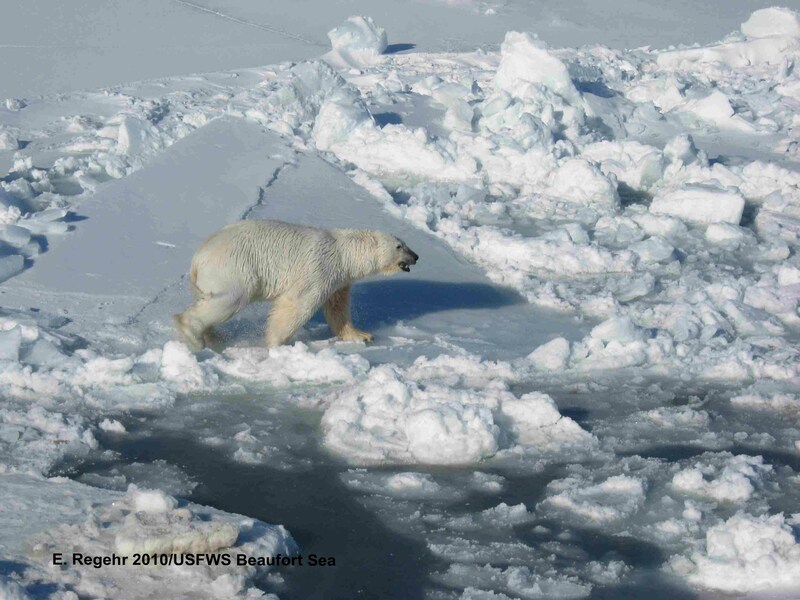 Polar bears were tagged in 2013 on the spring-time sea ice of the southern Beaufort Sea. Three bears followed here don’t appear in the July track – their collars might have stopped working or fallen off (most likely), they might have left the area entirely (also possible) or they might have died. The researchers don’t say [no caption provided for original]. Click to enlarge. How does this summer compare to last year, when the ice level in September reached its lowest point since 1979? At the end of July 2012 (Fig. 3), all 10 bears with collars were on the ice. By the end of August, after a huge cyclone ripped through the Arctic earlier in the month (Fig. 4), seven out of eight remaining bears with collars were on the ice and one was on shore (almost certainly in a maternity den). The two missing ones might have had their collars fail (most likely), or they might have left the area entirely (also possible), or they might have died. Figure 3. July 2012. Ten bears with collars at this point, all of them on the ice. Click to enlarge. Figure 4. August 2012. Eight bears with collars, seven on the ice, one on shore. Click to enlarge. Maps for other months, back to 2009, are available here. Keep in mind that when the ice is moving (retreating away from the coast in summer, advancing toward the shore in fall), some of the onshore/offshore movement of the tracks over the course of the month may reflect the bears attempting to stay with the ice edge as it moves. To put all this into perspective, note that research in this region between 2000 and 2005 determined that, on average, only 3.7% of all Southern Beaufort polar bears spent time on land between mid-September and the end of October (Schliebe et al. 2008). As the estimated total population at that time was 1,526 bears (and still is), it means that on average, only about 56 bears spent time on land each summer in the early 2000s. Research to keep an eye on, I’d say. Fish and Wildlife Service 2009. Ongoing polar bear research in Alaska. US Fish & Wildlife, Anchorage, AK. pdf here. Pagano, A.M., Durner, G.M., Amstrup, S.C., Simac, K.S. and York, G.S. 2012. Long-distance swimming by polar bears (Ursus maritimus) of the southern Beaufort Sea during years of extensive open water. Canadian Journal of Zoology 90: 663-676. Polar Bear News. 2010. Polar bear newsletter of the US Fish & Wildlife Service, Anchorage, Alaska. pdf here. Polar Bear News. 2013. Polar bear newsletter of the US Fish & Wildlife Service, Anchorage, Alaska. pdf here. Schliebe, S., Rode, K.D., Gleason, J.S., Wilder, J., Proffitt, K., Evans, T.J., and S. Miller. 2008. Effects of sea ice extent and food availability on spatial and temporal distribution of polar bears during the fall open-water period in the southern Beaufort Sea. Polar Biology 31:999-1010. This entry was posted in Life History, Sea ice habitat and tagged Alaska Science Center, Beaufort Sea, Chukchi Sea, Davis Strait, females with radio collars, Hudson Bay, Regehr, Rode, satellite radio collars, summer ice minimum, summer sea ice, swimming polar bears, tracking polar bears by satellite, US Fish & Wildlife, USGS. Bookmark the permalink.